SANSHIN has 3 laboratory / reagent shelf series which consist of steel model, wooden model, mix model steel and wood. 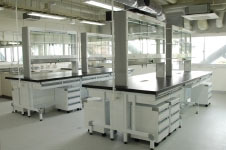 Especially, steel laboratory bench "steel lab system" is a new era model. This model with steel has strength and safety, and also chemical proof with powder coated surface. It's a eco friendly product without VOC emissions. This model consist of leg, frame, drawers, cabinet, rack, so in case of breakage or aged deterioration of parts, it's possible to exchange only those parts to new ones. Even the surface component of top of table is exchangeable. It's easy to recycle, and dispose seperately. Usual frame laboratory system "Frame lab system" and wooden laboratory system "Classical lab system" are also available. This lab system is made of steel mainly, therefore, durable and good for ecology. It's a flexible lab system with use of a large space under the table.